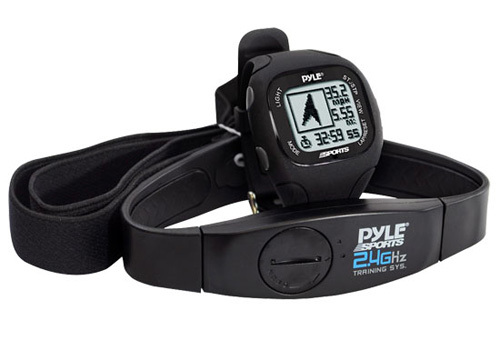 Pyle has launched its latest tech product, a GPS sports watch with built-in heart monitor chest strap too, but what will make this offering stand out in what’s already becoming a pretty crowded maket place? US-based company Pyle, known for making different kinds of audio equipment, has unveiled a new GPS sports watch, which acts as a personal training and monitoring device with plenty of navigation functions too. But, it’s not just a regular sports watch, it comes with a 2.4 GHz digitally coded wireless Heart Rate Monitor (HRM) chest strap too, to keep track of your heart rate and see how you’re coping during strenuous exercise. The watch has four main functions, Compass, Time Mode, Navigation and Workout Mode, which provides you with all kinds of data, like speed, performance, distance, workout duration and heart rate. In Workout Mode you’ve got your own personal trainer, with Fat Burn and Aerobics settings to keep you motivated. The great thing about the GPS sports watch (officially called the PSWGP405) is that it can be used for all kinds of activities, like running, hiking, even things like sailing (it’s water resistant up to 30 meters under water if you get clumsy) and hunting! The special HRM chest strap consists of a contact pad to get all kinds of heart stats, as well as an elastic band to keep everything in place. Our main issue with these kinds of health and fitness monitoring gadgets at the moment is they’re just too annoying, uncomfortable or bulky to wear all the time. The GPS sports watch seems pretty wearable, but teamed up with a chest monitor? We’re not too sure but look forward to trying it out for ourselves. Find out more about the devices over at www.PyleAudio.com.